Using coupons can be fun and rewarding. The feeling of saving 75% off your bill is great! However, using coupons can be a really bad experience, if you aren’t prepared. Personally, I have never felt bad for using a coupon. I make sure I am honest with my coupons. I do not try to “get over” on the system with a coupon. Due to this, I feel there is no reason for me to feel bad. When I started couponing over 10 years ago, I certainly have had cashiers that have tried to make me feel bad about coupons. Even still, I never feel bad about using my coupons. I have read stories of people leaving a store crying after being berated for using coupons. When your cashier says “NO” you cannot use this coupon, you have to be prepared. You have to make an instantaneous decision on how you will handle the situation. In the end, you may not always be able to use your coupon. Personally, I do not feel like I have to win every time, even if I know I am 100% right. Sometimes, it is just easier to say, thank you, but I have decided to not purchase the product. I have been in the situation where I have an exceptionally good deal and will ask the cashier for a manager. So how can you avoid the big NO at the register and feeling bad when you get a NO? I guarantee that you will have another cashier say No in the future, regardless of what you do. You can take some steps to have less of a chance. Follow these tips to get less NOs and feel good about your couponing! Know your store’s policy – This is the most important step to successful couponing. National stores such as Rite Aid, Target, Walmart and CVS have corporate coupon policies. You should be able to find these on their website or by calling corporate customer service. Many grocery store chains have individual store policies to compete with competition. So, I highly suggest that you go to the actual store you shop at and ask for their coupon policy. If they do not have it written, take the time to write it down while you are at the customer service desk. After you write it, note who you spoke to, their title and date. I suggest trying to get the policy directly from a manager, if they don’t have it written. Print and carry the store policies in your coupon binder – If you need it you can show to the cashier. This will allow you to show the cashier why you believe what you are presenting is correct. Know how your coupon is meant to be used – Taking the time to learn coupon terminology is so important. Make sure you understand what the coupon is offering. If you aren’t sure, ask someone who is. There are many great sites available to explain coupons and of course, you can always contact me. Use your coupon the way it was meant to be used – If you are using coupons to try and beat the system, you will likely get caught. Not only is it coupon fraud, you are taking money from the company. 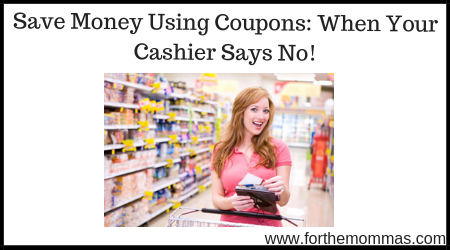 If you are honest, you will have a clear conscience about your coupon practices. If you have a clear conscience, you should never feel bad, no matter what the situation is. Stick to reasonable limits – If you go in and try to use 40 of the same coupon, you may have trouble. Even though you are using the coupon as it is meant to be, most stores have policies on how many you can use in a transaction. This is something that may cause a cashier to immediately red flag you. Share the wealth – Take the time to be friendly with your cashiers. Many people believe that “flying under the radar” is the only way to coupon successfully. I am always friendly and wear a smile. If a coupon is giving the cashier a problem, I try to help them figure it out. I know this won’t always work, but most times it does. Also, share the wealth with the cashiers. Most of them are curious as to how you are able to do this. Share your favorite blog or share a coupon. Know when to say NO thanks – Sometimes the deal just isn’t worth it. If you have an angry cashier or manager, keep your cool. There will always be another deal, another store and another cashier. If the situation has escalated to hostile, say no thanks and leave the store. A store cashier should never make you cry. If you are to that point, you can simply say you’ve decided not to make the purchase. Don’t threaten the cashier with phone calls to corporate or reporting them to a manager. Remain calm and follow up with managers and corporate once you leave the store. Let us know if you have any other suggestions or tips.